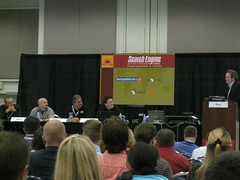 The SEO Rehab & Intervention was a great session oh how we are all addicted to something in our industry. Granted it was a bit of an un-structed session, but that’s what made it entertaining. The discussion flowed from chocolate cake to Twitter and SEO. Spend your time on what your doing next. Things change, so should you. Why check your page rank daily when it changes quarterly? When page rank does change, and if yours goes down, check the sites in your industry. Did they all go down? If so, stop panicking. Other time wasters include checking rankings, backlinks and pages indexed constantly. Feed your addition with tools that will do the checking for you. Then you can get a quick overview. Look at overall trending. If your links go down one month, is it going down month over month? What’s the trend? Take care in choosing KPIs. Don’t rely on rankings. Build your website for seo from the bottom up. 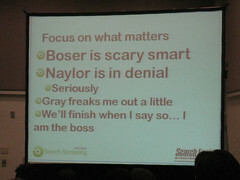 Don’t try to be an expert in every SEO technique. Focus on your strength. It was an interesting session with not a lot of takeaways, but a lot of fun none the less.